A wayward moose created quite the commotion after it was caught on camera dodging traffic, traversing through residential neighbourhoods and running across airport runways in Markham, Ont. CTV Toronto helicopters captured footage of the young moose walking around a wooded area between the Buttonville Airport in and Highway 404, just south of 16th Avenue, on Friday morning just after 7 a.m. Buttonville’s control tower first reported the ambling ungulate. “The concern, of course, is that this is an active airport, there’s planes landing, and you’ve got an animal that could weigh anywhere between 1,200 and 1,500 pounds,” CTV Toronto’s John Musselman reported. At one point, the bull even galloped across a number of runways at the airport, Musselman said. Animal services were called about the sighting and the Ministry of Natural Resources (MNR) set out to tranquilize the moose in order to move it out of the busy area. Before that could happen, however, the moose was on the move again and ran through the parking lots of a number of industrial buildings near the south end of the airport. At one point, the moose dashed across Woodbine Avenue where it came close to at least two vehicles before it made it safely to the other side. Just after 11 a.m., the animal leapt over a fence and entered a nearby residential neighbourhood, Musselman said. 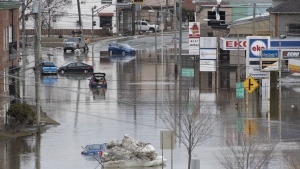 The Ontario Provincial Police and the York Regional Police were advising motorists to be cautious in the area. Schmidt said it was rare for moose to travel south into the Greater Toronto Area. Jolanta Kowalski from the MNR suggested moose may be more active this time of year because it’s mating season. A portion of Highway 404 was closed for a short period of time when it seemed as if the moose might venture onto the busy highway, officials from the MNR told CTV Toronto. “If it gets on a roadway and hits a car, it can have lethal results for a driver so we have to consider the safety of the public,” Kowalski said. MNR staff armed with tranquilizer guns have been tracking the moose since 10 a.m., Kowalski said. She said the aim is to “funnel” the animal into a green space without shooting it with a tranquilizer in the hopes that it follows the ravine system northward. If that fails, the employees will try to tranquilize it a safe distance away from the public. “The goal is to assess how quickly you can do it, how safely you can do it, because safety is the main thing here. Not only for people who live in houses nearby, but there’s a road and an airport at play,” she said. Sandy Donald of the Ontario Wildlife Rescue told CP24 that MNR staff will need to tread carefully so as not to spook the animal. “If it becomes agitated or if it becomes afraid, then it’ll start running all over the place and that’s not good for the moose and it’s not good for people,” Donald said. It’s likely the moose will be transferred further north once it’s caught, Donald suggested. The moose paused for a break in a ravine at approximately noon ET before it set out again towards another residential area. Footage captured by the CTV Toronto helicopter showed the bull jumping over fences into homeowners' backyards and crossing neighbourhood streets. It damaged at least one backyard fence. The animal’s urban adventure has spawned at least two parody Twitter accounts: @Moose_On_Loose and @Buttonvillemoos. “Can’t believe how famoose I’m getting…” @Buttonvillemoos tweeted Friday afternoon as media outlets across Canada began following the animal. Click to watch extended video of the moose. 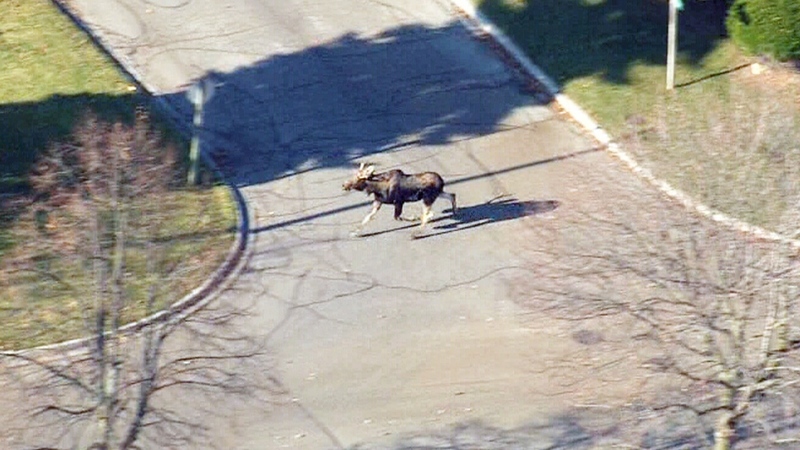 An aerial view of a moose wandering through the streets of Markham, Ont., Friday, Nov. 24, 2017.